Moctezuma II - here we’ll just call him ‘Monte’ - reigned from 1502 to 1520 and was one of eleven Tlatoque or “Great Speakers” to rule the Aztec empire, on behalf of Huitzilopochtli, the warlike Aztec patron god. Monte’s training as a member of the high nobility was strict from the start. He attended a Calmecac, a religious school for children of nobles or for really clever children from poor houses. Monte was the grandson of Moctezuma I, who ruled the Aztec lands from 1440-1469: that gave him a headstart; but he needed to prove his worth on his own merits. We know Monte had been a great war leader and was also a priest and an astronomer. Dozens of richly dressed nobles and high officials surrounded the Aztec emperor, Moctezuma Xocoyotzin, whose name means “Angry like a Lord”. He wore ornaments of gold, precious stone and fine feathers, and a crown of turquoise gleamed upon his head. As he was considered to be both man and god none of those who accompanied him dared look into his eyes, preferring to shield their own and divert their gaze. Moctezuma Xocoyotzin reigned from 1502 to 1520 and was one of eleven Tlatoque or “Great Speakers” to rule the Aztec empire. The product of generations of aristocratic marriage alliances with nobles of old Toltec origin, Moctezuma represented the civilised traits of this people and the glory of Topiltzin Quetzalcoatl, the priest-god and Toltec patron. 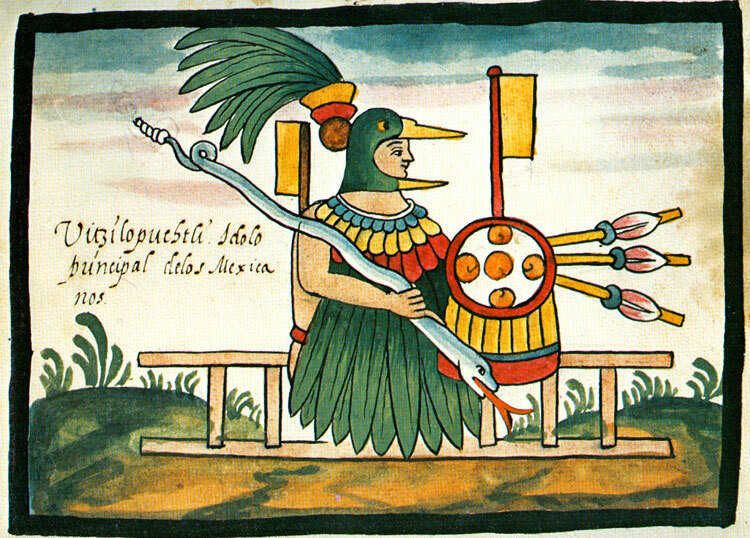 The emperor also acted on behalf of Huitzilopochtli, the rougher, less refined and more warlike Aztec patron god. Having risen to power in his forties, this Aztec leader was complex, pious and intelligent. Read on to find out more about his life, from his training as a young boy to his coronation and unwilling hand in the Aztec empire’s fall. 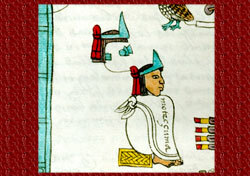 Moctezuma’s training as a member of the high nobility was strict from the start. He attended a Calmecac, a religious school for those of noble descent or high achieving common children. There, he learnt to steel himself against cold, pain and self-sacrifice. His routine at the Calmecac involved waking up before dawn and performing rituals for the gods such as sweeping, bathing in cold water, letting blood from his ears and legs and tending to gods’ shrines. 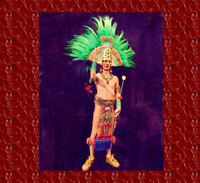 Moctezuma’s intellect and hard work were instrumental in his development as a priest and later on in life he would gain the privilege of performing sacrificial rites. A youth, he would train alongside commoners and learn to become a warrior. As a young noble, he was unaccustomed to receiving special attention. 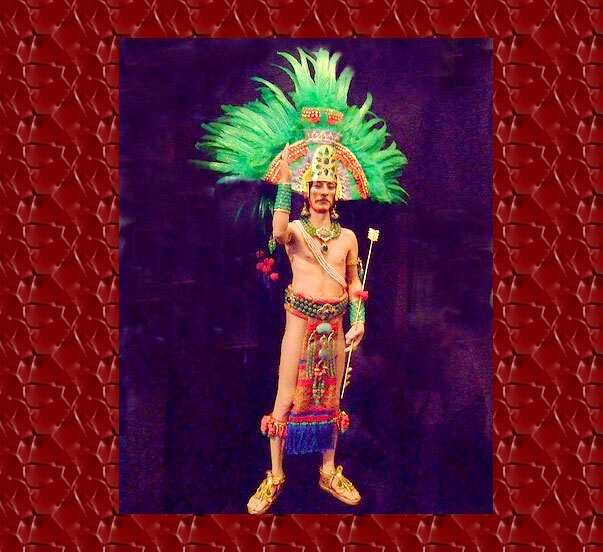 As a young man, Moctezuma won a competition by being the first to climb up a tall pole and grab the effigy of the fire deity, Xiuhtecuhtli, during the harvest festivity of Xócotl Uetzi,”Great Fall of the Xócotl Fruit”. This earned him the honour of becoming one of the four priests that held down a sacrificial victim, live image of Xiuhtecuhtli, whose heart was extracted. The venture up the pole was not only a development for his religious career; Moctezuma showed his skill as an athlete, by reaching the top before any of his competitors, noble or common. 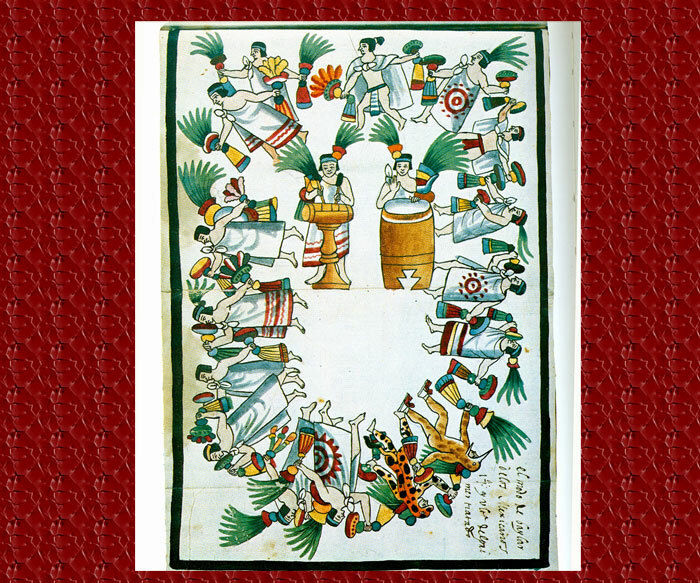 Learn more of the Xócotl Uetzi festival by following the link below. As a gifted man born into a very exclusive lineage, it was natural for Moctezuma to be destined for great things. After all, although Huey Tlatoque were essentially elected into power, they must have either a brother, father or grandfather who had held this role in the past. Moctezuma Xocoyotzin was the grandson of the old (Huehue) Moctezuma Ilhuicamina, who ruled the Aztec lands from 1440-1469. We know that Moctezuma Xocoyotzin performed well at war and was also an accomplished priest. During his thirties, he became commander-in-chief of the Aztec legions. He was often absent from Tenochtitlan, expanding the empire on campaigns abroad, but his elevated rank meant that he could keep a palace outside of the city grounds, near Tollan (Tula) and Cholollan (Cholula). 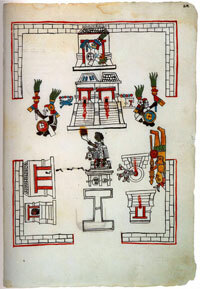 By then, he had married his first wife, Tezalco, who had given birth to a daughter, Tecuichpo. 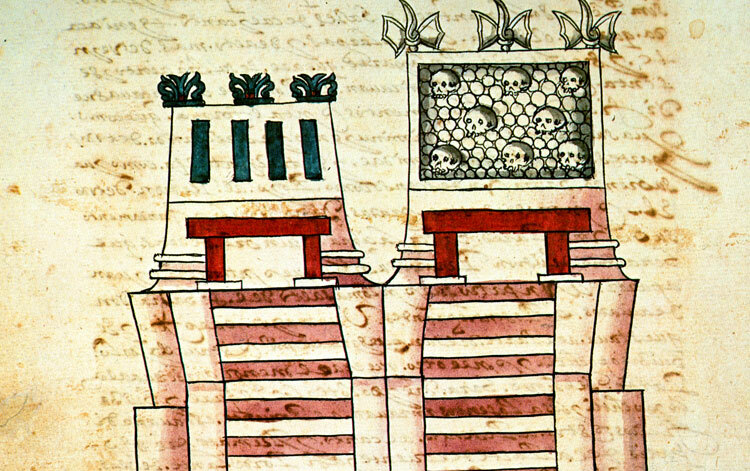 Nahua texts tell us that in 1502 the Huey Tlatoani* of Tenochtitlan, Ahuítzotl, took a trip out to see the construction of a storm barrier that was to protect the city from tempests that periodically rushed across Lake Tetzcoco. As he walked along the top of the barrier, Ahuítzotl’s delicately clad foot slipped on some stones and he fell over the edge. Although he did not plummet far, his head struck the rocks below him and he never recovered. Three days later he was dead. *Tlatoani is singular. Tlatoque is plural. 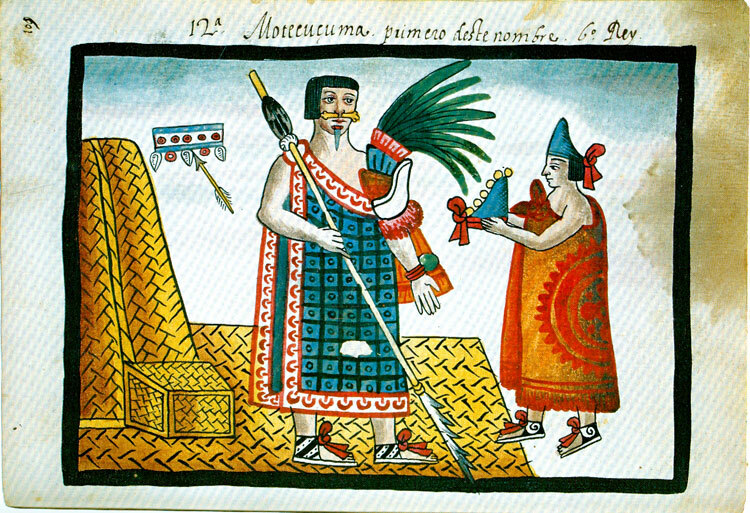 The death of Ahuítzotl caused a state of suspension within the Aztec empire. 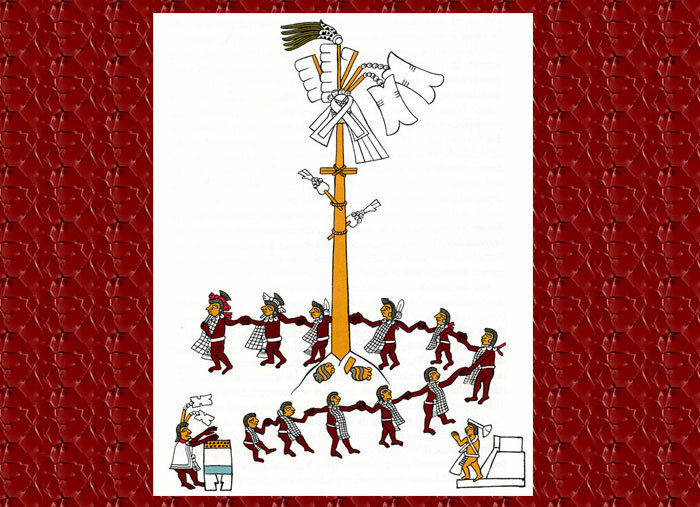 Investigators tell us that during the 16th century the power of the Huey Tlatoani became increasingly sacred and absolute. Therefore, all of the ceremonies surrounding Moctezuma’s accession to the throne were taken with the utmost seriousness. Once he was chosen, Moctezuma must make a symbolic withdrawal from society. This served to detach himself from his previous identity as army commander. He was stripped of all finery and emblems of rank. In a simple loincloth he was taken by the leaders of Tetzcoco and Tlacopan, two allied states, to the base of Tenochtitlan’s great pyramid. Feigning weakness as a sign of humility, he climbed the steps and at the top donned a dark green cape of skulls and crossbones that signified his withdrawal to a primordial state, a ritual time of beginning. 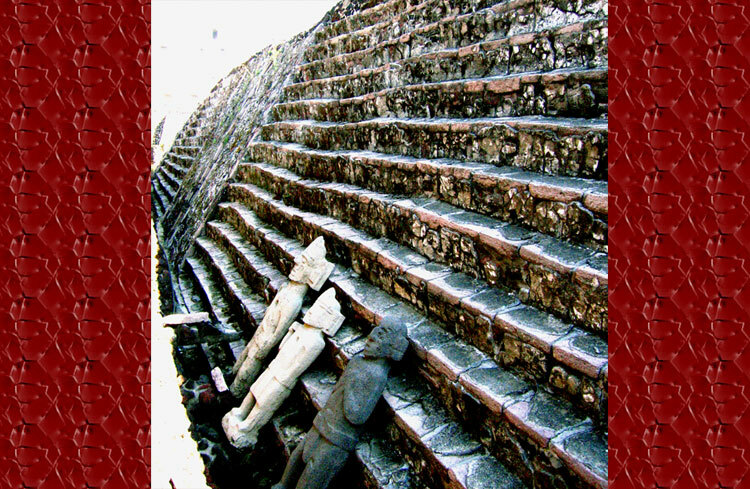 After burning incense at Huitzilopochtli’s shrine he descended the temple steps in front of a silent crowd. From there, Moctezuma entered a military house, Tlacochcalco, where he disappeared from the world for four days and nights. 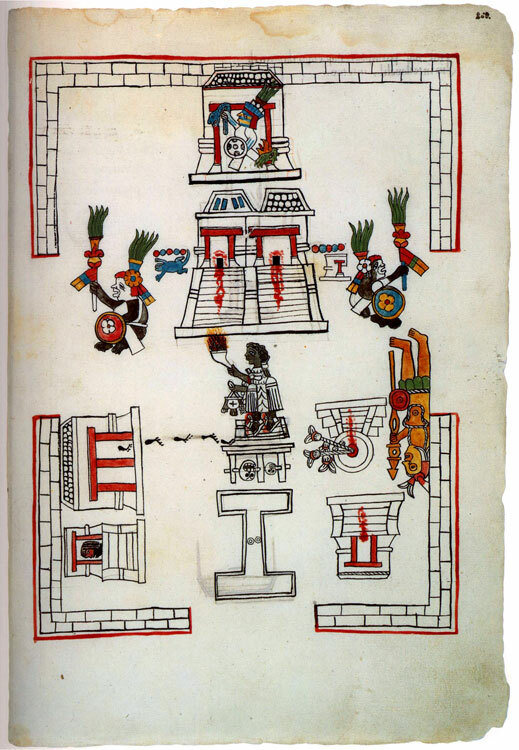 In Tlacochcalco he fasted and ritually let blood from his legs, earlobes and arms, and only left to return to Huitzilopochtli’s shrine in the great pyramid to burn incense. At the end of this four day period he bathed himself in a ritual act of purification. 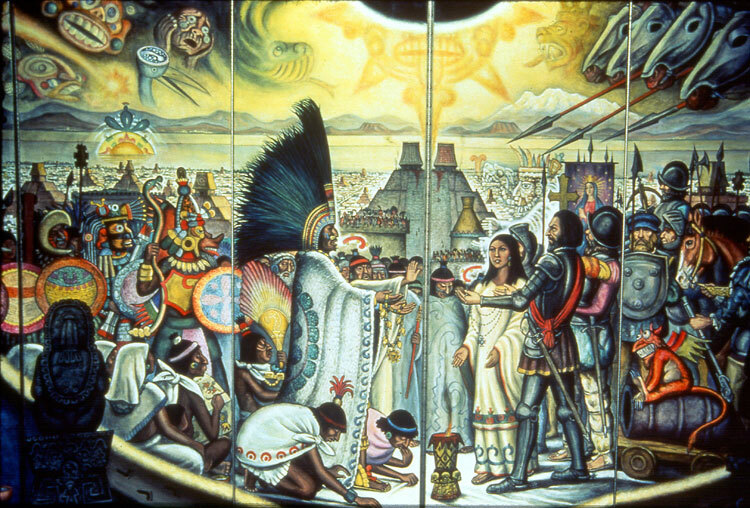 In contrast to his sombre and humble retreat, Moctezuma’s coronation was a magnificent event. It signified his birth into society as a leader. Dressed in royal regalia he was led to the jaguar-and-eagle throne (”Oceloicpalli, Cuauhicpalli”) where he listened to speeches from elders and other kings. Their dialogues were meant to help guide Moctezuma in his new role. At the top of the great pyramid, Moctezuma let blood from his ears and legs with a sacred jaguar claw. Before Huitzilopochtli’s shrine, he sacrificed quail. Then, he walked to a Quauhxicalli (stone sacrificial basin) and a Sun Stone, representative of the sacred solar calendar. Here, he was presented by his peers as the centre of the world. More blood letting followed. A visit to the Coateocalli, the house of foreign gods worshipped in all of the Aztecs’ captured lands were kept, followed and Moctezuma’s bloodletting here bound him to participate in the calendar of religious festivals. 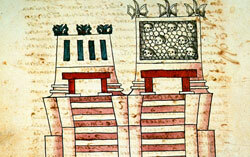 From there, his task was to enter Yopico, the cave-like temple of Xipe Totec, Flayed Lord of the Spring. 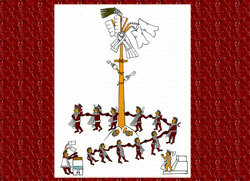 The Tlatoani gave his blood as an offering to the earth. This was a very important stage as it was vital for both the production of sacrificial victims and the finance of the coronation ceremony to come. It also helped to prove the new Huey Tlatoani’s authority over his empire. For his coronation war, Moctezuma travelled north to the regions of Nopalla and Icpactepec and returned victorious to a clamour of applause. Not all Huey Tlatoque experienced success during their coronation war. The emperor Tizoc (1481-86) brought home few captives after his battle, the Aztec army suffering great blows. This failure set him up for a weak reign and he experienced many uprisings within the Aztec territories. He died in 1486 and is thought to have been poisoned. Having travelled back to his seat of power, Moctezuma prepared himself for his confirmation ceremony. This involved him presenting new clothes to those he invited. Invitations were sent to all rulers and people of standing - even enemies were asked to come! Of course, presents were expected to be offered and those that did not give proper gifts might be demoted or even exiled. With the confirmation of the Huey Tlatoani, the administrative order that had been left by the previous leader was now thought to be re-established. 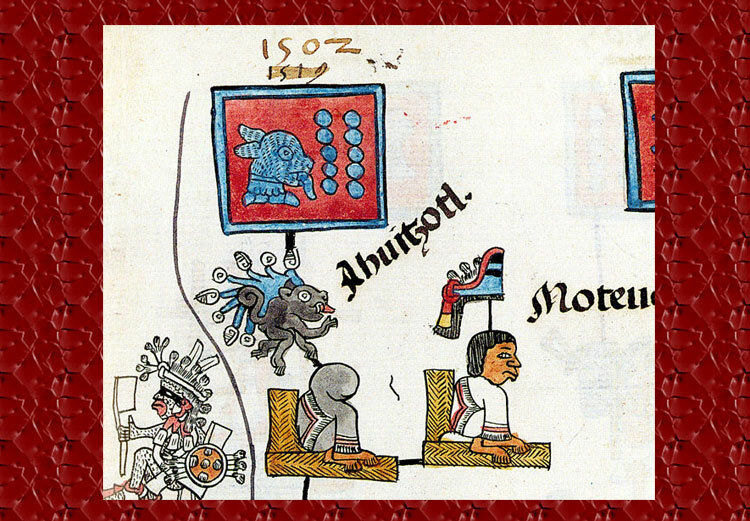 Moctezuma awarded high ranking subjects with emblems of authority. The feasts that took place on this day were funded by the royal household in a gesture of generosity and great wealth. 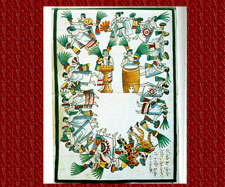 In the palace patio, the Tlatoques of Tetzcoco and Tlacopan led some 2000 nobles and high ranking warriors in a great dance accompanied by the large huehuetl drum. Moctezuma made a grand entrance, standing amidst the thick smoke of incense. 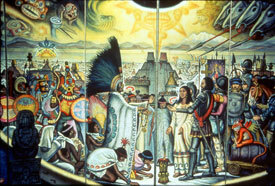 He was Huitzilopochtli’s living image, the warlike centre of the Aztec world. He was now both man and god. The confirmation ceremonies, took place near or around the palace and great temple. As for Motecuhzoma’s data of birth and age in the time of succeding the throne we have two contradictory versions, no one of which can be confirmed now. Actually Bernal Dias del Castillo described him as a man in his early forties or even younger in 1519! This implies that he was born around 1479-1480, and was only 22-23 years, when he ascended the throne. However, there are much more common versions, obviously of Mexica origin, that he assumed rulership in the age of 35 and therefore was born in the year 13 Rabbit or 1466. This statement first appear in the Spanish text of the Codex Mendoza, and repeated by the sources of the Chronica X group including Cronica Mexicana of Motecuhzoma’s grandson Fernando Alvarado Tezozomoc. This means that in 1519 Motecuhzoma must have been 52 years old, symbolic number in Mesoamerica. Among others things it’s “one human age”. 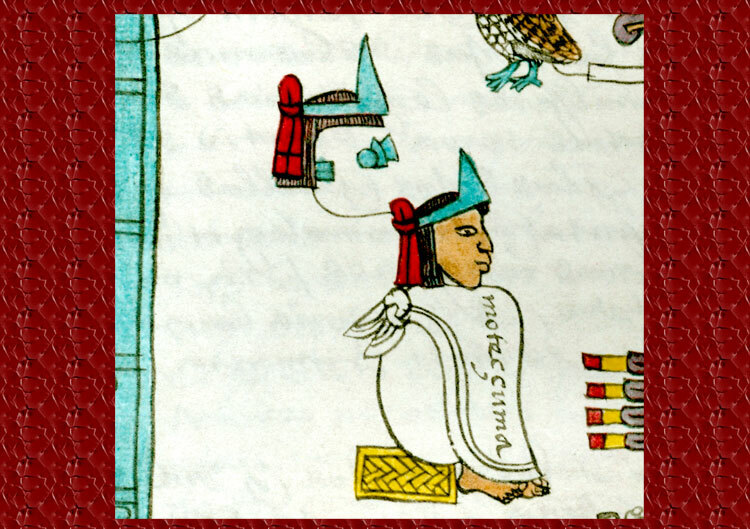 Therefore, Michael Graulich in his book about Motecuhzoma denied it as obvious “invention”, which fit in Nahua view of events (See Graulich M ‘Montezuma ou l’apogee et la chute de l’empire azteque’. According to Mexica vision Motecuhzoma should to be 52 years old by the Spanish arrival, because it meant that his last hour had come.